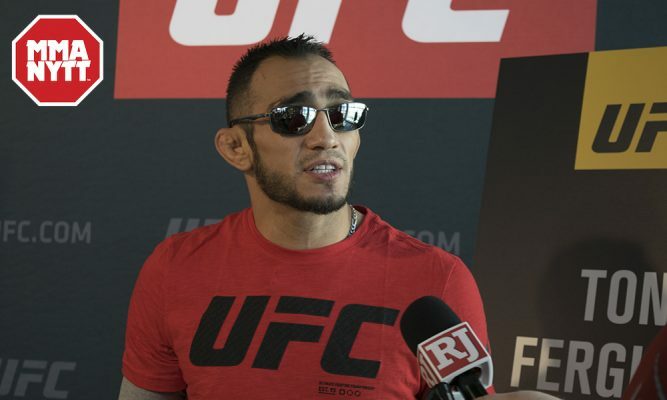 Former UFC interim lightweight champion Tony Ferguson is ready to fight again after an aggressive rehabilitation schedule got him back on track following surgery. Tony Ferguson is ready to fight again. The former UFC interim lightweight champion has been undergoing an aggressive rehab campaign after having knee surgery that stopped him from facing Khabib Nurmagomedov back in April. While doing a blitz of media interviews ahead of the fight at UFC 223, Ferguson slipped on a cable in one of the studios, which ended with “El Cucuy” suffering a serious knee injury. Now just four months after the surgery was completed — with a nasty scar to boot — Ferguson says he’s ready to book his next fight after being cleared by his doctors. Ferguson returns to a volatile lightweight division that has shifted dramatically since he last fought. Nurmagomedov has now moved onto a lightweight title fight against the returning Conor McGregor, who will make his first appearance inside the Octagon since 2016. If he’s not getting a title shot immediately, the most logical opponent for Ferguson would have appeared to be Dustin Poirier, who is riding a three fight win streak including victories over former UFC champions Anthony Pettis and Eddie Alvarez. Unfortunately for Ferguson, Poirier is now facing Nate Diaz at UFC 230 in New York on Nov. 3. As of now, there’s no word on who Ferguson might face or when he’ll actually fight again now that his knee has been cleared to allow him to return to action. With a 10 fight win streak on his resume, Ferguson obviously jumps right back into the deep end of the lightweight title race once Nurmagomedov vs. McGregor is settled in October.